I know some of us get excited when we find new Lupin goodies, so I thought it'd be a good idea to make a thread where we talk about our latest finds, news on new merchandise that's coming out, or link to places where you can find a good deal on them. You can also help out other users that are searching for hard-to-find items or items they need to exchange or sell (be sure to use the PM system to discuss selling/buying from users, to keep your and others' private information safe!). At the moment, there's a seller on eBay who has a ton of Lupin OST CDs for a decent price. Another user has a couple of Medicom dolls up for cheap, too! You can find them and other Lupin goods if you enter "lupin the 3rd" in the search box. This will probably interest me more than anyone else, but on eBay a while back, I came across a copy of a Japanese volume of World's Most Wanted, signed by Monkey Punch. I also discovered his artbook, Cuties for sale. I wouldn't mind getting my hands on that Lupin jump drive we heard about a while back. This will probably interest me more than anyone else, but on eBay a while back, I came across a copy of a Japanese volume of World's Most Wanted, signed by Monkey Punch. Last time I was on E-Bay I saw Lupin, Jigen, and Fujiko Stylish Figures in jail--and Lupin and Jigen are in black-and-white prison uniforms. The black-and-white ones are part of the green jacket stylish figures. Are the red jacket stylish figures less common than the green jacket ones? I think that everyone buys up all of the red jacket stuff the first day of a con and all the green jacket stuff is left since it's lesser known than red jacket. Anime Palace is usually at every con I go to and the vender there says that usually the Lupin figures sell out first, leaving only all of the other characters. 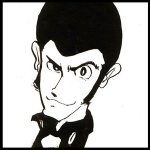 I would like to mention that on Lupin the Third Encyclopedia, there are links in the WMW manga section that have a site that carries a few volumes still in stock. Thread stickied for goodness. Good on you, Linda! It looks like for the 30th anniversary of Castle of Cagliostro, there's going to be a special edition collection of the DX figures: one of COC Green Jacket Lupin and one of COC Wedding Dress Clarisse! I might have to do a two-parter for this thing. HLJ has a TON of Lupin goods on the way! The prices on those things are just right, but how big are they, exactly? The DX figures are pretty tall, the Green Jacket Lupin I have is about 10" inches while Zenigata is about the same height. I'm not sure about the Action Pose set. Does it say the height in cm? Not sure, the picture is there but it, in and of itself, is pretty dang small. Thanks for starting this thread! I love collecting Japanese toys in general and anything related to Lupin and company is especially exciting. At this point my collection is pretty modest, with an assortment of the small collectible figures, a few DX figures, a couple die cast toys, plus the Hot Wheels Cagliostro set (all three cars blister packed together). I also have three of the Chrono cars that came with the Pioneer, Red Jacket series DVDs. For me the holy grail of Lupin toy collecting used to be the large scale model of the Cagliostro Castle that Wave put out more than a decade ago. It is HUGE! However I have recently learned through a good friend in Japan of a new and similar item from another company, and this thread is obviously the perfect place to post a link to it. Apologies if this has already been posted elsewhere. Thank you for the link Mattel Jones! I've got a bigger post planned later on, but I thought I'd put this up. While it isn't merchandise you can buy or order, this is the website for the Lupin III Heiwa pachinko machine that came out not too long ago: Lupin III: Tower of Lupinus! it's made for people like myself that would like to bid on yahoo auction japan but have no clue how to. they have a small surcharge for bidding on your behalf but they're quite reliable. I've used them before to obtain doujinshi and soundtracks.